This year, our annual peer to peer fundraiser, the People-Powered Challenge comes at a new moment for The LP. We are excited to intentionally name one of The LP’s new values as being People of Color (POC)-centered in our Strategic Plan. Building on our work over the past 13 years, The LP is committed to championing POC voices, cultures, imaginations, knowledge, and leadership. Using creativity, we will push against complex systemic injustices in pursuit of a world in which all people—across race, ethnicity, class, age, gender, sexuality, religion, ability, nationality, and immigration status—are free to be their whole selves. 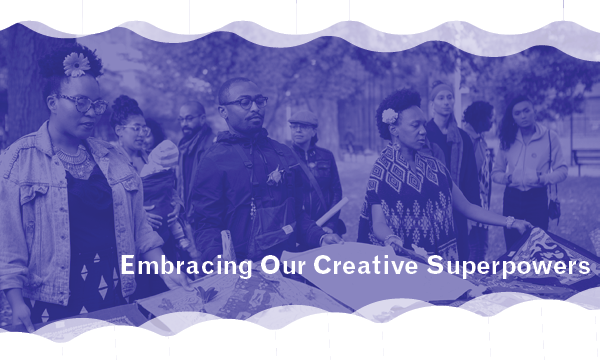 Being a POC-centered organization that advances artist and neighbors as change agents requires The LP to have the resources to support our community in calling upon its creative superpowers: voices, cultures, imaginations, history, archives, healing practices, and more! Our 2018 People-Powered Challenge annual fundraising campaign will champion “embracing our creative superpowers.” Join us in support of everyone being free to be their whole selves and embracing their own creative superpower by signing up to help The LP reach a fundraising goal of $40,000 in 10 days between October 20-29. The People-Powered Challenge is The LP’s annual 10-day campaign where we fundraise through the collective power of our friends, family, neighbors, and social networks to support people-powered art and strengthen our communities by getting supporters, new and old, to invest with us in our work. People Movers help us reach $40,000 by committing to asking 10 people or more (friends, family, neighbors, etc.) to give at least $10 each during the 10 days of the campaign. We’ll give you all the tools and resources you need to succeed! Amplifiers help us spread the word about the campaign through social media and other channels. Find us on Facebook and Instagram here. Invite people you know to sign up to fundraise for this campaign by forwarding this form to them. Spreading the word about this campaign through social media and other channels. Find us on Facebook and Instagram here. Sign up to volunteer in our office to make calls to people movers and our donors to thank them. If you have any additional questions, please email specialevent@laundromatproject.org or call (718) 574-0798.